Life is a continuous maze of relationships. This aMAZE! Getting Along Journey Handbook for sixth, seventh and eighth graders has Girl Scout Cadettes maneuvering through all its twists and turns to find and maintain true friendships, plenty of confidence in themselves, and maybe even peace. This handbook contains 144 pages. Life is a maze of relationships and this journey has Girl Scout Cadettes maneuvering through all its twists and turns to find true friendships, plenty of confidence, and maybe even peace. The adult guide offers tips for talking about relationship issues with girls, and pointers for understanding Cadettes' development and creating a safe, welcoming space. 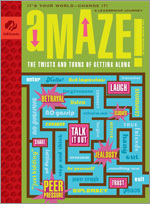 Page 62 of the aMAZE adult journey book cites this GSUSA documentary program that elicits discussion about issues like bullying, relational aggression, cyberbullying and romantic relationships. Download (ZIP) and install this program resource to run on your own computer (Windows only), and read the Facilitator Guide (PDF). The Interact Award signifies that girls can advance peace in the world around them—one interaction at a time. To earn it, girls must complete three of the nine Interact Challenges—though they can do as many challenges as they like! These challenges invite the Cadettes to try small—and positive—new ways of interacting in their daily lives. The Diplomat Award focuses on how a diplomat ''possesses skill or tact in dealing with others.'' To earn the award, Cadettes demonstrate that they can use something they have learned about relationships to design and implement a project that benefits others. The Peacemaker Award invites girls to collect relationship ''tools'' they can use and pass on to others along the journey. The girls earn the Peacemaker Award at the end of the journey by reviewing all the tools they've collected and making a commitment about how they will continue using them throughout their lives. Girl Scout Cadettes have an opportunity to put their skills to work assisting Girl Scout Brownies on their Quest. Brownies (and their volunteers!) will appreciate having Cadettes along on the journey, and Cadettes will benefit from having the opportunity to have a position of responsibility. The steps for Cadettes to earn the LiA are in the Adult Guide for ''Brownie Quest'' and also available online (PDF). Your Girl Scout council is a great resource to identify Cadettes who might be interested in earning this award.